We have tried so many little sushi places and having a plate of sushi and a glass of wine definitely takes me to my happy place 🙂 I happened to stop off at a little place after work one night and thought to give them a try and oh heaven.. they make amazing sushi. 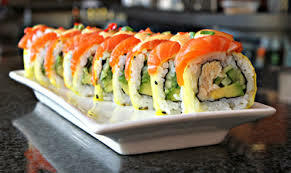 Everything you can imagine, yummy Philadelphia rolls, dragon rolls, amazing salmon roses, tempura prawn rolls, tempura crab rolls, the list is endless. They did not have one thing that was not absolutely delicious! !